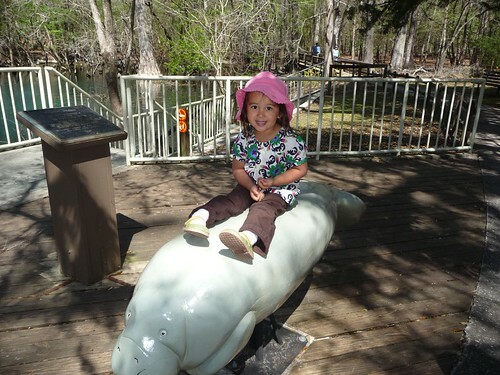 Mali Mish – Day 39: Manatee Springs State Park. Our first few days in Florida have been a slew of one night stays with short jaunts to the next spot in the afternoon. We have gotten use to spending the whole day and all night driving and logging in the neighborhood of 200 – 400 miles during travel days. 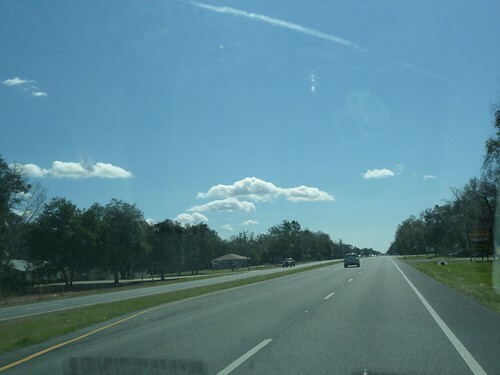 We have slowed down significantly since we got to Florida to about 50-75 miles a day and for good reasons – so we can see clear skies and fluffy clouds like this one. Even though we are driving shorter legs, we are actually covering a lot of ground since one night stays means we are driving everyday. Being that there is so much to see and do here in Florida, we are kind of at a loss of where to go and how long to stay at each place. Marlene spends much of her time in the passenger seat searching for campgrounds and checking vacancy thanks to our Sprint 3G data card and her Blackberry and I punch in cities and points-of-interests into the GPS to check routes and distances. How did people travel before all this technology!?!? 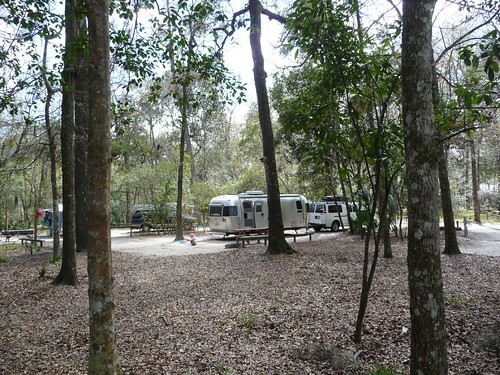 We arrived at Manatee Springs State Park near the city of Chiefland, Florida just a little over a hour down the road from Perry, FL where we boondocked at the Wal-Mart the previous night. 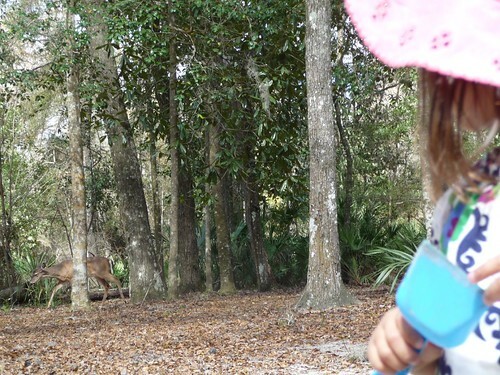 It is our second Florida State Park in three days and we are very impressed. They are so far a perfect 2-for-2. Manatee Springs is beautiful and very well maintained. Our back up site comes with electric and water hookups as well as a nice picnic table and fire pit. All for only $20 a night. The tall trees in the campsite are just beautiful to look at and makes you feel like you are in some kind of magical forest. This is why we like State Parks. Look at how much space we have between us and our neighbors! At a so called ‘RV Resort’, there would be 10 RVs between where this picture is taken and where our Airstream sits. If there is one thing bad to say about Manatee Springs, is that there are barely any phone and Internet reception there. To a lot of people, that is actually a plus. Us on the other end, need to work while we are on the road so as much as we would like to stay here for a few days, we probably should leave tomorrow as it will be the start of a new work week. Today, our phones are off and we are exploring. Ava in the last few days has been really longing for Marlene to spend more one-on-one time with her. She has Marlene asked a few times to see if I can hold Mila instead of her. Today, her wishes came true. 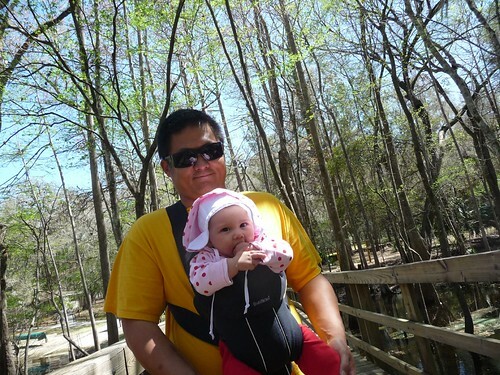 Mila also got to sit in the Baby Bjorn so she can face forward to do some sight seeing of her own. 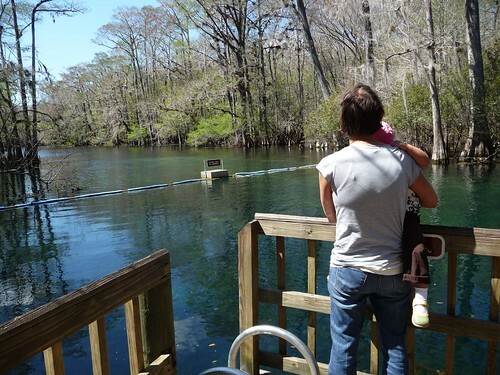 Manatee Springs is a natural spring where natural water from the underground aquifers flow into the Floridan river systems. 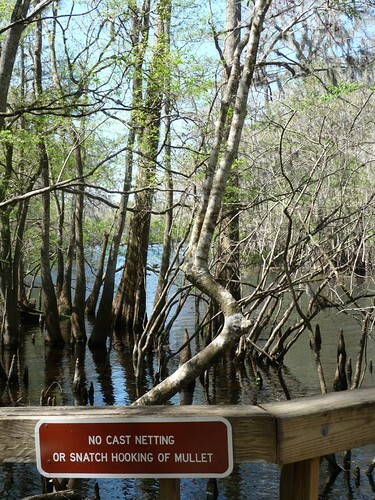 There are lots of springs like this all over Florida and the water is naturally at around 74 degrees year round. 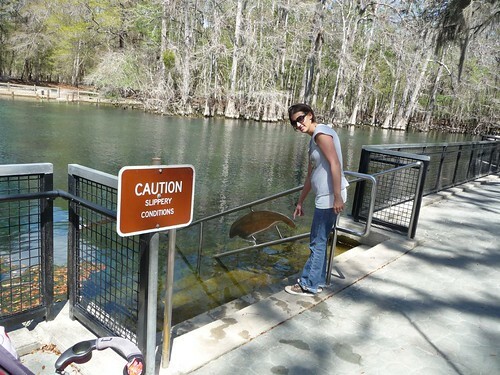 That is also the reason why the manatees like to hangout here in the colder months where the river temperature dips well below that. For those of you not familiar with Floridan marine life, a mullet is not a trendy haircut from the 1980s. Rather it is a type of fish that leap out of the water surface for some unknown reason. At the end of a planked walkway along the spring, we get to where the spring meets the Suwaneee river. The intracoastal waterways of Florida is very extensive and will one day be a great way for us to see the state in a sailboat. But for now, I will focus back on our terrestrial expedition. 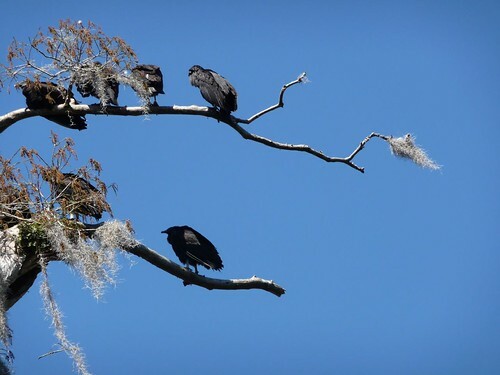 Hanging out above the trees along the river, there are also lots of these black vultures that contribute their talents in rounding out this ecosystem. One of the things I did not expect so far in Florida is how much wildlife is all around us. Driving along highway 98, between the panhandle and towards Tampa, there are lots of wildlife management areas right by the highway. As we drove last night towards Perry, Florida, we probably saw well over 50 deers standing on the side of the road over a 60 mile distance. Since this is our only night here at Manatee Springs, we needed to see some manatees. 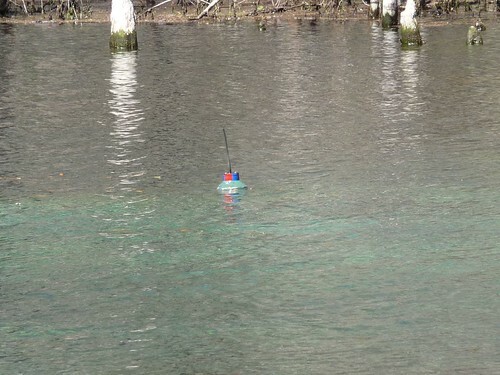 But today, the only one we saw was at a distance and is apparently attached to this float for tracking purposes. The only time to see this guy is when he briefly comes up for air since the glare in the water makes it hard to make out shapes at a distance. Unfortunately for us, he never came close enough and when he did come up for air, all you can see is just barely his nostrils for a brief moment. Come up Mr. Manatee! Come closer! Well, a stainless steel cutout of a manatee will have to do. Even better, how about a status that Ava can ride on? 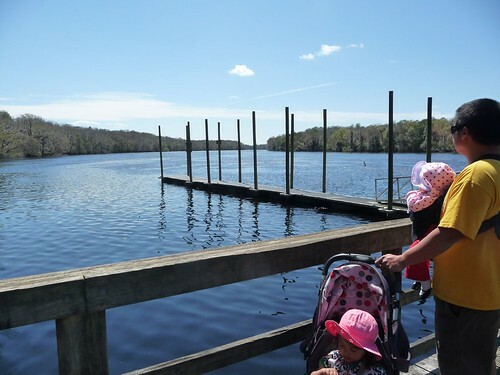 Between the campground and the spring, there are some recreational areas. 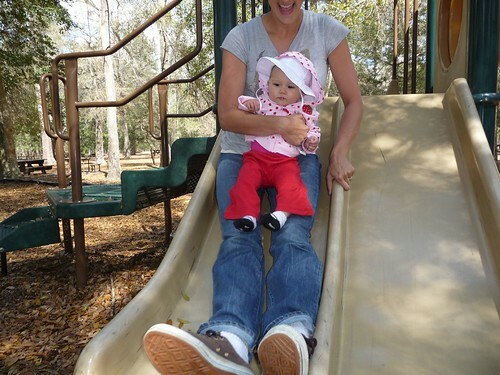 A nice little playground gave Mila a chance to take her first ever swing ride. 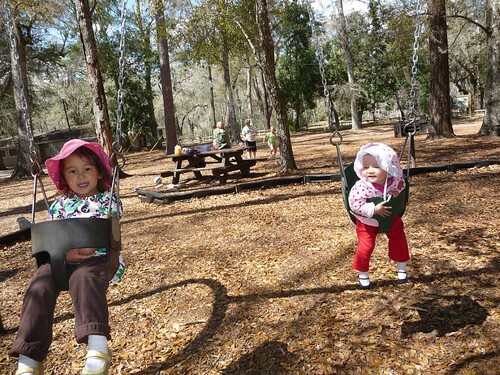 Look at your big sister Mila, she is an expert at swings. How about a ride down the slide? Well, she’s not quite ready to do that alone. A ride with mama will have to do for now. We are surprised to see how close the water levels are to land in the entire gulf coast since we first saw it at Corpus Christi. Here at Manatee Springs, there is little room for the flood water to rise before it reaches dangerous heights. 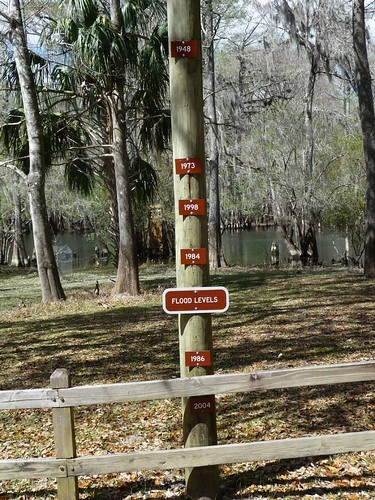 This pole shows some of the record highs they have had at these waterways dating back to one of the worst floods in this area ever in 1948 when the water came up well over 8 ft high past the campgrounds path way. Nearby the campground there is also this little green water hole in the ground that is real popular with the scuba divers. 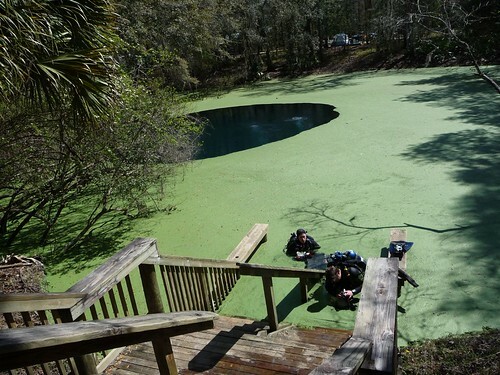 It is called Catfish Sinkhole and is the opening to a pretty extensive underwater cave system here at Manatee Springs. Parts of the cave system are actually directly under the campsites we are staying on. This sinkhole opened itself up over years and years of acid rain and eroded the surface of the limestone away to reveal the water cave. The green surface is just small fallen leaves that are floating on the top of the sinkhole. 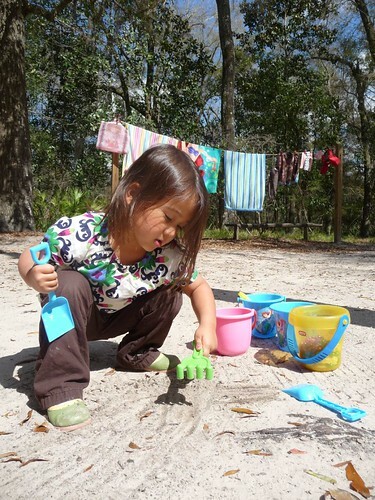 We took advantage of the nice weather and serene surroundings to take a little breath from our busy traveling schedule and also let our beach towels and swimsuits dry out on the clothesline. Ava promptly got to work with another hole to China. Or maybe she was trying to build a trap to catch Bambi? 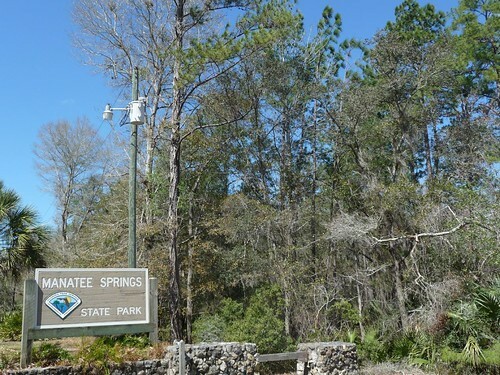 2 Responses to Day 39: Manatee Springs State Park. When we were vacationing on Sanibel island a few years ago, I think a tour guide in the nature preserve mentioned that the fish jump out of the water to try and clear organisms out of their gills that attach there as the fish are bottom-feeding. 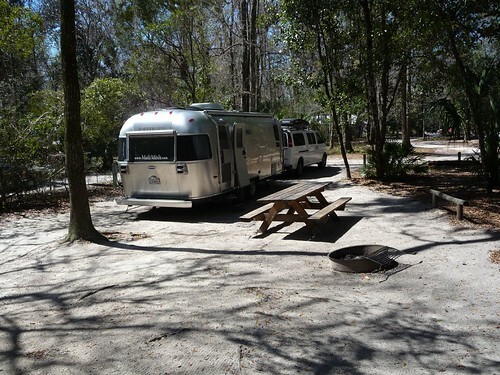 Anyway, nice Airstream blog! I followed the link to it from Rich Luhr’s blog (I think.) You guys should make a Google Earth overlay with GPS coordinates that link back to your posts. It would be a nice resource for people planning their travels, and you’d get more blog traffic, as well. Keep up the good work! Have fun! Hi Craig, Thanks for the comment. There was actually a sign there stating that as one of the 3 possible reasons why the mullets jump out but it also stated that none of them were yet scientifically proven. I am always trying to make improvements on the site so any suggestions are much appreciated! Thanks again for coming to our blog!